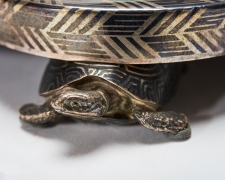 This colorful set made of silver with partial gilt and champlevé includes a base supported by four silver turtles. The base is decorated with scenes taken from Japanese painting that are reminiscent of the ukiyo-e style. Scenes from the natural world, plants, flowers, and mushrooms are depicted alongside representations of Japanese actors and pedestrians. Each scene is quite clearly separated from the next through geometric frames and abstract patterns. 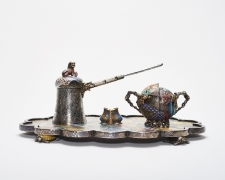 On top of this base sit two silver, enameled containers that are traditionally included in silver or glass absinthe sets: a sugar bowl with finely incised handles in the shape of stems, whose main body is colorfully decorated with Japanese scenes similar to the ones seen on the tray; and an absinthe decanter with an uncolored main body and incised decoration that includes Japanese theater masks, floral motifs, and human figures. The decanter has an impressive, colorful lid on top of which rests a "shi-shi" dog, and a long handle with cut-out floral decorations. 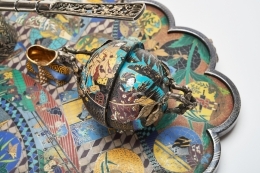 The form and decoration of this silver set allude to the popularity of Japanese visual culture in European decorative arts of the late 19th century. 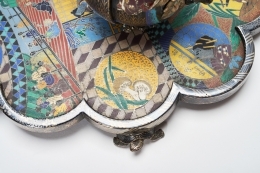 The highly decorative, colored enamels reproduce Japanese ornamental patterns borrowed from lacquer, ceramics, prints, fans, and textiles. The design of this gilt silver and enameled absinthe set is attributed to Paul Legrand (1840-1910), a French designer and engraver who joined Boucheron in 1863. worked there until 1867, did a stint at Froment-Meurice followed by one at Baugrand, before finally returning permanently to Boucheron in 1871 where he remained until his retirement in 1892. 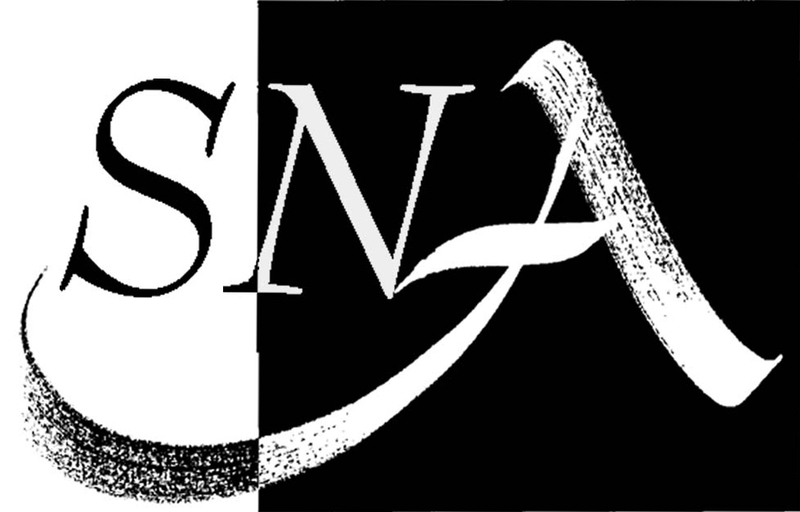 His designs are very distinctive. 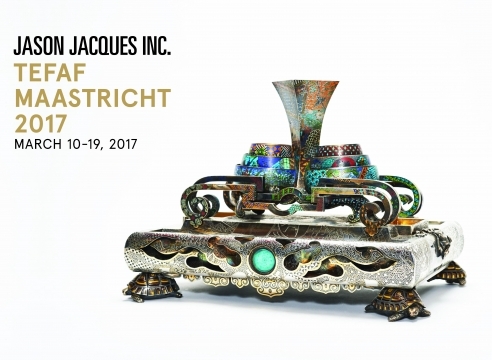 He was primarily a colorist who was captivated by the effects of light; hence, he used transparent enamels and crystal glass, various patinas and gold. He was strongly influenced by the Orientalist aesthetic that was popular among artists and designers in the late 19th century. 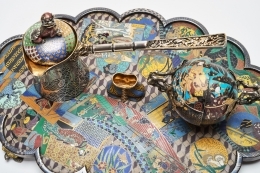 The Boucheron archives mention a similar set intended for tea service, which includes a tea pot, sugar bowl, and cups on a tray supported by turtles. While the tray has a diferent design, the bowl and pot remain almost identical. 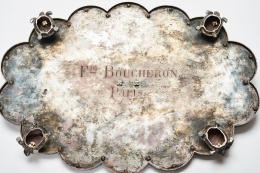 The present silver set was most likely made by Charles Glachant, a well-known silversmith who worked for the Boucheron firm for several years. Of Glachant, Frédéric Boucheron wrote: "Mr. Glachant is a skilled silversmith. 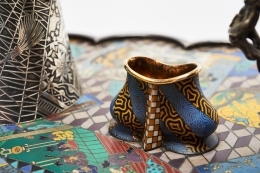 The goldsmithery of my Japanese pieces are often challenging when it comes to their execution, because of the complexity of assembling such fine metal parts together, but Glachant overcomes such difficulties completely."